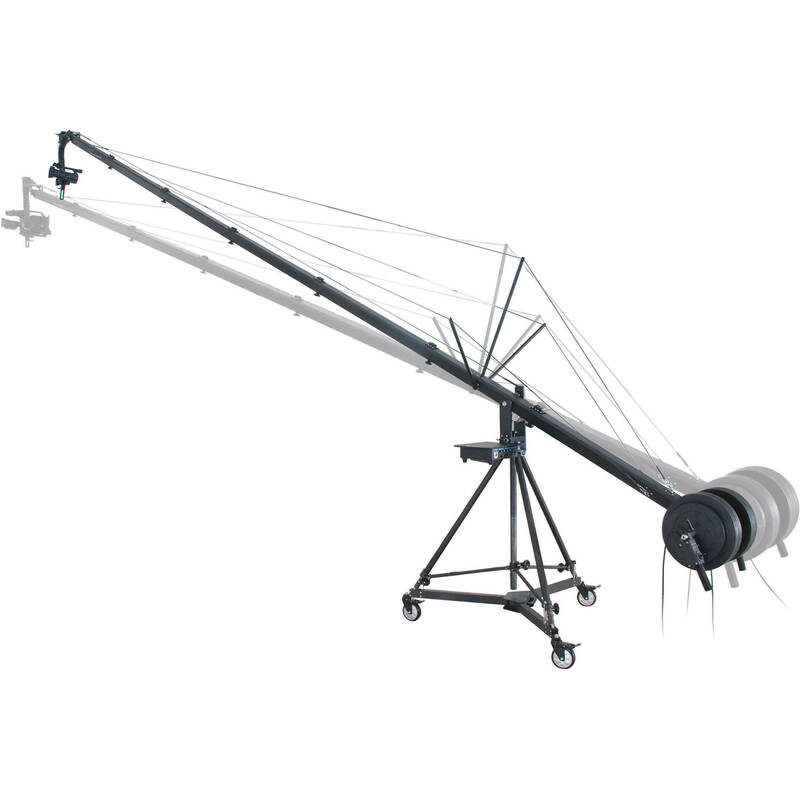 The Secced 6M Travelling Crane is a camera jib with 18’ total arm length and 15.4’ maximum lens height. It offers complete remote control of pan-tilt head and is designed for use with LANC-enabled Canon/Sony (H)DV camcorders and Panasonic DV and HD handheld camcorders. The jib's main components are the Jib arm, Pan-Tilt Remote Head, Controllers (control box and remote control bars for head and camera), Tripod, and Dolly. The complete Traveler jib set fits into two hard cases (one larger roller case and a smaller suitcase). The jib comes with a slip ring for remote head pan movement. The HD signal can pass through the slip ring, which means the remote head can output the HD signal. The remote head has max payload of 22 lb. You can control the pan and tilt movement of the remote head and also adjust the speed and damp of pan and tilt movement. The DV controller can control both Sony/Canon camcorders with LANC jack and Panasonic handheld-type (ProLine) DV and HD cameras with "REMOTE" labeled jack (HVX/HPX/HMC/DVX/DVC Series). For Sony and Canon DV/ HDV cameras, it offers functions such as of control zoom/focus, power on/off, Fader, back light on/off, and start/stop recording. For Panasonic DV/HD cameras, the controller offers functions such as control of zoom/focus/iris and start/stop recording (available functions may depend on the camcorders). The crane system features tilt and pan lock for safety and a V-mount interface for attaching a battery.